As we have now heard, the Journal News of the Lower Hudson Valley of New York plans to release more names and addresses of pistol permit holders. In an article in the Huffington Post, a journalism professor at the State University of New York at New Paltz thinks the publishing of the names, addresses, and other personal information of Journal News staff in retaliation was "childish and petulant." Howard Good, a journalism professor at the State University of New York at New Paltz, called the critics' response childish and petulant. "It doesn't move the issue of gun control to the level of intelligent public discussion," he said. "Instead, it transforms what should be a rational public debate on a contentious issue into ugly gutter fighting." That would be the same Professor Howard Good who lives in the Village of Highland in Ulster County, New York. He is fortunate that his 1,944 square foot raised ranch house built in 1972 has a full basement. I wish I had a full basement. The constant refrain that we've heard every minute of every day since Newtown from the gun prohibitionists, the politicians, and the mainstream media is that we must do something, we must "demand a plan", we must pass a law. Josh Felker of LoneStar Handgun in Schertz, Texas decided to do something but it isn't what the gun prohibitionists and their political and media allies are advocating. Mr. Felker offered 400 slots in his Texas CHL classes free to teachers in Texas. The teachers in Texas took him up on the offer and all were booked within 24 hours. Middle school teacher Kim Williams traveled from Houston to cash in on Saturday's free concealed handgun licensing course offered to educators after the mass shootings at a Connecticut elementary. “I feel the need to be proactive,” Williams, 38, said during a break in the 10-hour class at LoneStar Handgun. Felker is trying to build momentum to get Texas laws and policies changed to allow teachers who are Texas CHL holders to be allowed to carry on campus. Gov. Rick Perry (R-TX) is one of those who supports this move. According to Felker's site, Dury's Gun Shop in San Antonio will pay for a CHL class for any Texas teacher who purchases a handgun from them. While I don't know for sure, I imagine other Texas instructors and gun shops are making similar offers to Texas teachers. I certainly hope so. Josh Felker and these teachers are making a positive contribution to keeping kids safer in Texas classrooms. Experience has shown that active shooters tend to be cowards and kill themselves when confronted by an armed person as was the case in the Portland, OR mall shooting. Just as it is rare to have multiple shootings, so too is it rare to have subway riders in New York City murdered by being pushed in front of an ongoing train. New York City has had two of these murders within the last month with the last one happening on Thursday. Both of these murders seem to have been committed by people with mental problems. Given that multiple shootings as well as murders by being pushed on the tracks fall into the realm of "black swan events" - that is, very rare and very difficult to predict - it is interesting to compare the comments of Mayor Michael Bloomberg after the Newtown shooting with his comments on the latest subway pushing murder. Mayor Michael Bloomberg said commuters should "exercise care" after Thursday's attack. He suggested little could be done, though, to prevent what he called a "rare occurrence." "It's a very tragic thing," Mr. Bloomberg said. On Friday, in his weekly radio appearance on WOR-Radio's John Gambling Show, Bloomberg discussed the subway murder among other things. You can listen to it here. It starts at about the 11:48 mark and ends at the 13:15 mark. Gambling: Unfortunately another push on the subway. Bloomberg: It’s only two in, you know, a long period of time. (That) doesn’t help either person. I don’t know what happened here. I was talking to somebody the other day. We used to incarcerate an awful lot of people who were mentally ill. The courts or the law was changed said, “No, you can't do that because unless they are a danger to society, our laws protect you. And that's fair enough. If you look at, you go out on Long Island there are a number of old psychiatric big and all of them now are empty and falling apart. They are derelict buildings and just the roofs are starting to cave-in. (They) can become dangerous. Gambling: I read that the Governor is thinking of releasing even more people. Bloomberg: I don’t know. I haven’t talked to him about it. But yeah, you know, it cost a lot and the trouble is you may incarcerate the handful of people who do something wrong but you’d also incarcerate an enormous number of people who will never do anything wrong. And the essence of America is unless you do something wrong, we don’t incarcerate you. Right after this, Gambling asks him how he would integrate these thoughts with the Newtown shootings. The first thing out of his mouth is the comment that there will always be crazy people. He then goes into his usual harangue about guns, semi-auto firearms, standard capacity magazines, and how we need to ban them. I find the contrasting statements interesting. On the one hand, Bloomberg demands immediate action for one rare event involving a mentally ill person while on the other hand he dismisses another event involving again a mentally ill person as a "rare occurrence" that not much could be done to prevent. In both cases you have rare but deadly events involving mentally ill persons. Rationally, it is not the tool involved that is the causative factor of the event but rather the untreated mentally ill person. I think even Bloomberg understands this but for his own selfish and aggrandizing political aims chooses to ignore it. I came across this infographic on Facebook this morning. It is from the American Preppers Network. It examines how long it would take to get off 100 shots with various sizes of magazines assuming 3 seconds per change and 1 second per shot. Of course, both changes and aimed shots could be made in less time with practice but it is a starting point. Use this link to view the videos mentioned in the infographic. Bryon York, Chief Political Correspondent for The Washington Examiner, details a trip he took to Birmingham, Alabama over the holidays. He went to Hoover Tactical Firearms to shoot some of the more "controversial weapons". Disregarding his comments that the .45 ACP in the KRISS Vector is "hugely powerful", I think his comments about his talks with friends and relatives about gun and magazine bans are instructive. These are the gun owners who must be made to understand that an attack on one of us is an attack on all of us. Moreover, they need to realize that their scoped deer hunting rifles are nothing but "sniper rifles" to the gun prohibitionists. Should guns like the KRISS be legal to buy? 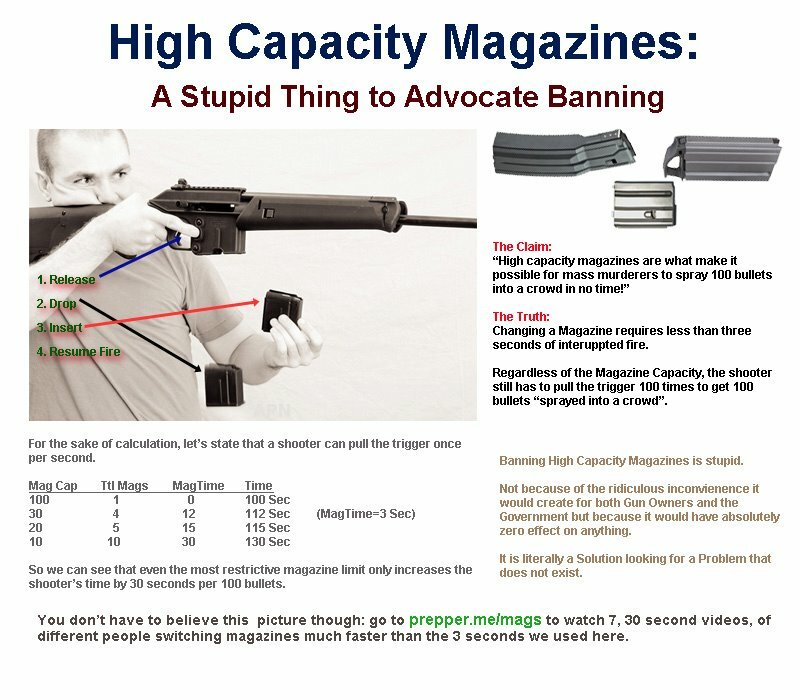 Or, at least, should they be harder to buy and their magazine size limited to, say, 10 rounds? Talking with relatives and friends, all of whom own firearms, I didn't sense much opposition to limiting the size of magazines. Nor did I sense much opposition to imposing the same sort of background checks on people who buy guns at shows as are currently imposed on people who buy them at licensed dealers like Hoover Tactical Firearms. As far as banning some types of guns altogether, many point out that beyond their military styling, "assault weapons" are basically semi-automatic rifles like zillions of other semi-automatic rifles with wooden stocks and a traditional look. They're the same guns. Even so, I didn't sense much opposition to banning the sale of some types of rifles. Even though as York reports that he didn't sense much opposition to the bans, he did report that nobody thought that they would be effective in stopping another Newtown-type shooting or any mass shooting. As a lump of coal for our Christmas stockings, the United Nations voted on Christmas Eve to restart debate on the Arms Trade Treaty. The talks had collapsed in July when a consensus couldn't be reached. It was felt at the time that this was due in part to President Obama not wanting the ATT hung around his neck going into the fall elections. Of course, this was denied by the US delegation. That was then and this is now. According to Reuters, the US supported the resumption of talks. But after Obama's re-election last month, his administration joined other members of a U.N. committee in supporting the resumption of negotiations on the treaty. That move was set in stone on Monday when the 193-nation U.N. General Assembly voted to hold a final round of negotiations on March 18-28 in New York. The foreign ministers of Argentina, Australia, Costa Rica, Finland, Japan, Kenya and the United Kingdom - the countries that drafted the resolution - issued a joint statement welcoming the decision to resume negotiations on the pact. "This was a clear sign that the vast majority of U.N. member states support a strong, balanced and effective treaty, which would set the highest possible common global standards for the international transfer of conventional arms," they said. There were 133 votes in favor, none against and 17 abstentions. A number of countries did not attend, which U.N. diplomats said was due to the Christmas Eve holiday. The exact voting record was not immediately available, though diplomats said the United States voted 'yes,' as it did in the U.N. disarmament committee last month. Countries that abstained from last month's vote included Russia, Saudi Arabia, Syria, Sudan, Belarus, Cuba and Iran. The move could intensify another high-profile fight between the administration, which backs the treaty, and the National Rifle Association (NRA) which says it will restrict the domestic sale of firearms. As I see it, we will have both a domestic and international battle on our hands in the coming months. Now, more than ever, we need to be united and to deluge Congress with letters, faxes, and emails demanding no new gun control. New Year's Eve is almost upon us and Clay Logan has said that the annual New Year's Eve Possum Drop in Brasstown, NC is a go. However, thanks to PETA and a foolish administrative law judge it will be a modified possum drop. Logan said Monday that he’s considering using a stuffed opossum or possibly a road-kill opossum. “It ain’t going to deter us from having the event,” said Logan. He expects the party to draw about 3,000 people to his store in Brasstown, about two hours west of Asheville. There’s plenty more to see than just the ’possum drop, added Logan. There will be music by a country and bluegrass band, a tribute to the men and women who serve in the military and a ceremonial firing of muzzleloaders by the Brasstown Brigade. Frankly, I hope they use a road-kill opossum for the event and then send it to Judge Fred Morrison as a memento of his ruling. Chris Muir nailed it today in his Day by Day cartoon. I would be proud to be considered a dissident given that CSGV already considers me an insurrectionist and gun extremist. It would complete the troika. Courtesy of Chris Muir and Day by Day Cartoon. Richard Pearson, Executive Director of the Illinois State Rifle Association, had this advice in his ISRA Thursday Bulletin. I consider them to be very wise words from someone who has been fighting in the trenches for gun rights for a long time. As you are aware gun owners have been taking a pounding from the anti-gunners and their allies- the main stream media. Those two groups have declared war on gun owners and we will be maligned, degraded, demonized, and bullied in an effort to turn one group of gun owners against another. Dont fall for it. I am a strong believer in the Farmer Doctrine. The Farmer Doctrine was adopted at the first Gun Rights Policy Conference in 1985. The Farmer Doctrine is patterned after the NATO Doctrine. The Farmer Doctrine is as follows: Be it resolved that an attack one group of guns and gun owners shall be considered an attack on all guns and gun owners. Therefore we should all rise to the defense of each other. By now, most people have heard about the newspaper in New York that thought it was a good idea to publish the names and addresses of each and every pistol permit holder in Westchester and Rockland Counties on an interactive map. Many are also aware that Christopher Fountain in his blog For What It's Worth thought that turnabout was fair play and has published the home addresses of the publisher, editor, and damn near every reporter on the Journal News. This move has gotten a lot of attention starting with Instapundit and now CNN. Politico has a story on it here. You can see part of the CNN interview below. Another blogger has taken this list of Journal News employees a step further and created an online map. Frankly, I think each and every time some harebrained journalist or editor gets it into his or her head to publish the names of legal permit holders - whether for pistols or carry permits - we need to respond in kind. The 112th Congress will come to a close on January 3, 2013 when the 113th Congress is sworn into office. Thus, introducing a bill into the House of Representatives in mid-December is all about appearance and has nothing to do with substance. Of course this doesn't stop politicians from doing just that knowing that these newly introduced bills will never get enacted. A case in point are three bills introduced on December 18th, 19th, and 21st that all deal with some aspect of gun control or call for gun bans. This was just days after the shootings in Newtown, CT. The congressmen in question are all Democrats who will now be able to say "they did something" but it was those "evil Republicans in the pocket of the NRA" who refused to act on their bills. The first bill, HR 6680, is by Rep. Bobby Rush (D-IL). Rush is a former Black Panther who's claim to fame seems to be that he beat then-State Senator Barack Obama in the primary for the 1st Congressional District. The title of HR 6680 is "To provide for the implementation of a system of licensing for purchasers of certain firearms and for a record of sale system for those firearms, and for other purposes." No other information is available on the bill and the text of it hasn't been sent to the GPO. If any text is ever sent to them I'd be surprised. The bill, HR 6685, is from Rep. Eliot Engel (D-NY) which would ban the FN Five-seveN pistol and its associated ammunition. Ostensibly the purpose of this ban is to protect law enforcement officers. To protect the Nation's law enforcement officers by banning the Five-seveN Pistol and 5.7 x 28mm SS190, SS192, SS195LF, SS196, and SS197 cartridges, testing handguns and ammunition for capability to penetrate body armor, and prohibiting the manufacture, importation, sale, or purchase of such handguns or ammunition by civilians. Again, like with Rep. Bobby Rush, no text has been received by the Government Printing Office and none probably will be received. It is a bill for show and not meant to actually be enacted. The final bill was introduced by Rep. Steve Israel (D-NY). HR 6704 would "reauthorize the ban on undetectable firearms". While I don't know how you would create an "undetectable firearm", Rep. Israel must have some special knowledge that I don't possess. Otherwise why would he seek to ban firearms that don't currently exist? I can't read the text of the bill to get some idea as - again - it doesn't exist. While this end of the session grandstanding is not limited to anti-gun Democrats, most of the other bills concern stuff like the naming of post offices or federal buildings.The real threats will come in January when the gun prohibitionists such as Sen. Dianne Feinstein (D-CA) start introducing their new bills. Now more than ever we live in an Orwellian world. Thanks to Bitter at Shall Not Be Questioned for pointing out a story on TMZ regarding BATFE intervention on behalf of David Gregory and his illegal in DC 30-round magazine. It seems officials in Comrade Napolean's, err, I mean President Obama's ATF contacted the Metro PD on behalf of NBC and were told Gregory could "display" the magazine. Well-placed law enforcement sources tell TMZ ... a staffer from "Meet the Press" called ATF before the show aired to inquire about the legality of David holding the empty magazine during a segment on gun control. We're told the ATF person contacted the D.C. police to find out if the District of Columbia -- the place where the show is broadcast -- had a law prohibiting such a display. Our sources say the D.C. police official informed ATF David could legally show the magazine, provided it was empty. An ATF official then called the staffer from "Meet the Press" to inform them they could use the magazine. Reader Stephen Johnson emails: “ATF approval simply makes no sense. The ATF has no jurisdiction over DC gun laws. And if, in fact, NBC news called the ATF to ask ‘permission’ this just reinforces how stupid they are about gun laws and jurisdiction. This story smells…. bad.” Hmm. If D.C. were a state I’d be sure this was correct. But since it’s a federal enclave I’m not sure. So if we get caught with anything illegal in DC, all we gotta do is tell the cop we want a “David Gregory”? Unfortunately, I think one has to be a member of the national propaganda corps aka the mainstream media to be able to get a "David Gregory". By now you may have read about the DC Metropolitan Police Department's active investigation into David Gregory. The host of NBC's Meet the Press thought a 30 round AR magazine would make a cool prop to shake in the face of Wayne LaPierre this past Sunday. What Gregory didn't think about was the DC law which forbids the mere possession of any magazine that is capable of holding more than 10 rounds. If he did think about the law, he obviously assumed it didn't apply to "esteemed journalists" such as himself. Now conservative attorney Aaron Walker is offering to defend Gregory on Second Amendment grounds in a challenge to the DC law. Walker, who blogs and tweets as "Aaron Worthing", made the offer yesterday on Twitter. Twitchy has aggregated the tweets by Walker on the subject here. Walker is better known for the whole Brett Kimberlin saga. While at first blush it sounds like a great idea challenging the DC law on Second Amendment grounds to get a gun hater off, in this case it is rather short sighted. As Alan Gura has pointed out many times in many venues, Second Amendment litigation needs to be strategic. Case law needs to built bit by bit and precedents set. It is a cumulative process where the success of the current case depends upon earlier positive precedents. This is the same process that Thurgood Marshall and the NAACP Legal Defense Fund used over time to defeat both de jure and de facto segregation by race. The threat to this strategy comes from both criminal attorneys trying to use the Second Amendment to get crooks off the hook and misguided ideologues like Leonard Embody who represent themselves in court. I think defending David Gregory in a court of law on Second Amendment grounds would likewise be a threat to this strategy. While you and I may disagree, I think it highly unlikely at this time that a court would find the DC restrictions unreasonable and inconsistent with the Heller decision. So I would say to Aaron Walker, while it sounds like a cool idea, don't go there if you care at all about the Second Amendment. I want to wish each and every one of my regular (and irregular) readers a very Merry Christmas. I hope that it has been full of joy and laughter and squeals of delight from the kids. I don't want to let politics intrude on this day so I won't. There is plenty of time starting tomorrow for that. Again, I hope all of you have a Merry Christmas and stay safe on this blessed day. 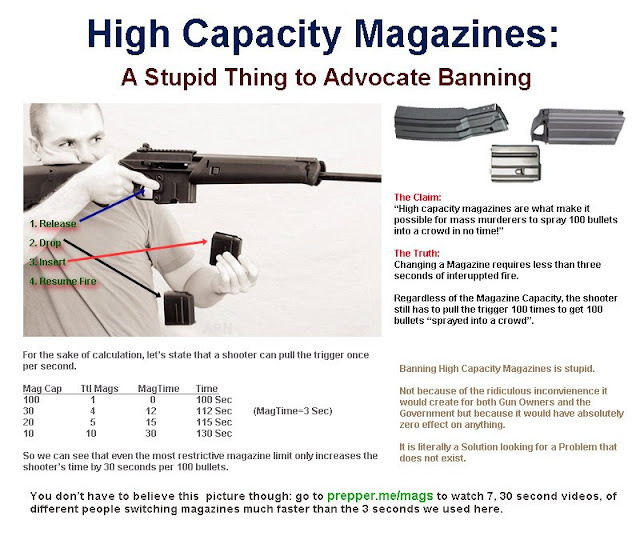 As has been reported many places on the Internet, David Gregory broke District of Columbia law regarding the possession of magazines with greater than 10 round capacity. It seems that NBC asked the Metropolitan Police Department if they could use that 30 round magazine in the Meet the Press segment. They were told it was not permissible before the show. A post on Arfcom has an email the Metropolitian Police Department has been sending out in response to people who have asked about the legality of Gregory's actions. The Metropolitan Police Department is in receipt of your e-mail regarding David Gregory segment on "Meet the Press." MPD has received numerous e-mails informing us of the segment. NBC contacted MPD inquiring if they could utilize a high capacity magazine for their segment. NBC was informed that possession of a high capacity magazines is not permissible and their request was denied. This matter is currently being investigated. Thank you for taking the time to bring this matter to our attention. Customer Service - Metropolitan Police Department"
Now it remains to be seen whether the DC police has the spine to charge Gregory with violating the law. I'm not going to hold my breath over that. UPDATE: This story and the news of the active investigation by the MPD has expanded outside the gun blogosphere. Breitbart had a story on it this morning and reported that Chief Cathy Lanier has confirmed there is an active investigation. Either he violated the criminal law or he lied. He certainly expected us to believe he held in his hand what he said he held. What made him think he could do that (or appear to do that)? He must think the law doesn't apply to him, or he wouldn't even pretend to break it. The Forsyth County (NC) Republican Party has nominated David Regnery to fill a vacant spot on the Winston-Salem Forsyth County Board of Education. Regnery is unapologetic in his defense of the Second Amendment and is a member of the board of directors of Grass Roots North Carolina. This has at least one county commissioner upset. Regnery holds a NC Concealed Handgun Permit and is certified by the NC Department of Justice as a concealed carry instructor. He is in favor of allowing school personnel carry concealed provided they received additional training to complement their NC CHP. Regnery disagreed that his life revolves around guns saying, ""My whole life is not surrounded by guns,' Regnery said. 'My life is surrounded by two children and my wife, and work.'" The story about Regnery's nomination was on the front page of Sunday's Winston-Salem Journal along with a story about the record-breaking attendance at the local gun show this weekend. The City of Winston-Salem has been one of the most vocal and consistent opponents of HB 650 which forced North Carolina municipalities to allow concealed carry in city and county parks. Now, according to this alert from Grass Roots North Carolina, they are seeking to have the law repealed in the wake of the tragedy in Newtown, Connecticut. Insensitively exploiting the recent evil mass-homicide within a “Gun-Free” Connecticut school, the Winston-Salem City Council announced a list of requested legislation they want to see from this year’s NC General Assembly. Among these demands is repeal of last year’s expanded park carry that was passed as HB 650. Incredibly, the Council responds to murder in a “Gun-Free Zone” by demanding expansion of their dangerous reach within North Carolina municipalities. Winston-Salem Mayor Allen Joines was quoted as saying park carry is “a mixed bag, and it’s confusing. The legislature pre-empted local governments’ authority to control local parks. I think they should leave that up to us.” Compliance with this law is as easy as permitting law-abiding citizens to carry everywhere. Left up to the Mayor, we would be unable to defend our families in parks. This type of endangerment can no longer be tolerated. Council Member Derwin Montgomery claims, “local governments have a right to regulate the time and place (arms are carried)”. So according to the Councilman, a right that “shall not be infringed” upon can be “regulated”? Perhaps Winston-Salem’s efforts are more-related to an attempt to avoid responsibility for violating the provisions of HB 650 and the resulting lawsuit pursued GRNC’s partner, Rights Watch International? Either way, Winston-Salem has earned a reminder from North Carolina gun owners that we will not permit expansion of dangerous“Gun-Free Zones” in our state, and have no patience for municipalities that violate state law by infringing upon gun rights. Suggested Subject: Don’t make parks “Gun-Free” murder zones. I am disappointed that you have decided to violate state law and continue to violate the rights of law-abiding North Carolina gun owners to defend themselves and their families in your parks. I am also disappointed that you are demanding that HB 650, last year’s expanded park carry bill, be rescinded. This important law decreases the area in which citizens are disarmed in our state. As we have seen with the increase in mass-homicides within “Gun-Free Zones”, places where citizens are prevented from being able to effectively defend themselves and their families are the most dangerous places in our society. I urge you to stop your promotion of “Gun-Free Zones” in parks, and to embrace the common-sense expansion of freedom created by HB 650. I wonder why the pitch for signing omits the strongest reason: "pontificating, underinformed, supercilious twit, whose arrival here was in violation of the legal prohibitions against importing foreign insect pests." I couldn't have said it better myself. As for deporting Morgan, that exile from Fleet Street, I say let him stay. He is a good reminder of what happens to a country when it has effectively banned most firearms and the right to self-defense. As I promised a couple of days ago, puppy pictures! 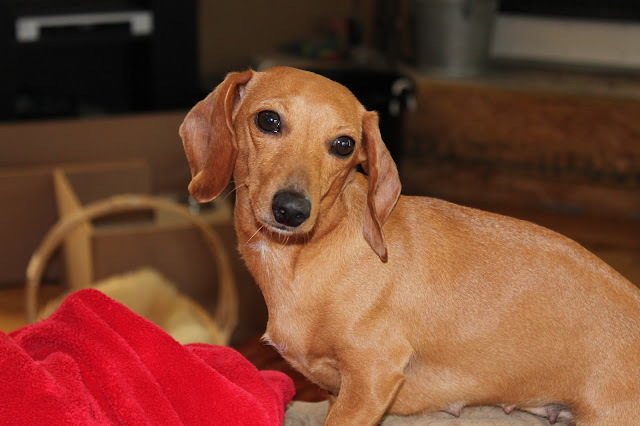 We stopped in Kentucky to pick up a Dachshund puppy for the Complementary Spouse's younger daughter Laura. Chipper - named for Atlanta Brave's great Chipper Jones - is the nephew of Laura's Dachshund, Sammy. We were driving from St. Louis to northern Kentucky a good part of the day. As a result I missed the NRA press conference and haven't had a chance to even read the transcript. I also haven't had a chance to listen to Michael Bane's DownRange Radio podcast which I understood was very good. 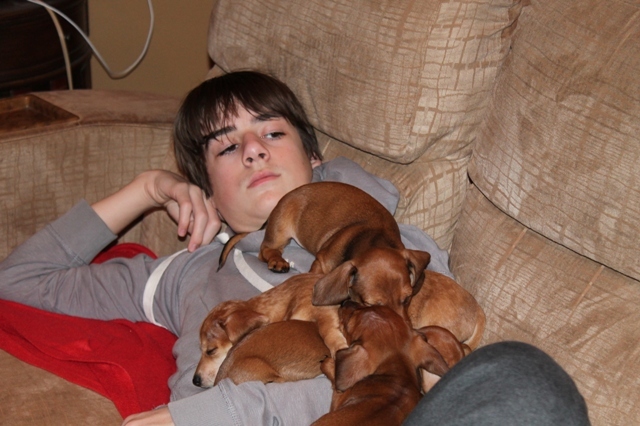 Sometimes mundane things like visiting family and playing with puppies take precedence over the events of the day. And you know what? That is the way it should be. 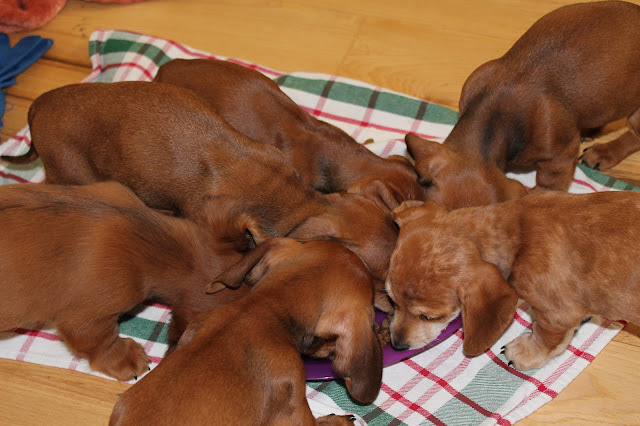 Puppy pictures will be posted in a couple of days. It's December 21st and the sun still came up. I guess that Mayan calendar thing was wrong. In honor of the sun still coming up, I'm posting Pitbull Daycare's cover version of REM's The End of the World as We Know It. You might say it is a bit edgier. Thanks to Michael Bane and his DownRange Radio for first turning me on to their version of this song. The Brady Campaign has just released a new public service announcement featuring celebrities including Mark Ruffalo, Mariska Hargitay, Rosanne Cash, Liev Schrieber, and Anthony LaPaglia. It features their "We Are Better Than This" slogan. What this PSA doesn't feature is the truth. When Liev Schrieber says that anyone can go on the Internet and buy as many guns as they want without background checks, that is not only misleading but a lie. When Anthony LaPaglia says convicted felons and the mentally ill can go to a gun show and buy guns, it is misleading. Dealers who operate at gun shows do NICS checks just like dealers in storefronts. Why would a felon risk going to a gun show where there is always a police presence (and probably undercover agents as well) when he or she could get a stolen gun from one of their criminal associates. In a post entitled "Make this their last stand", Joe Huffman discusses the battle we are in for our gun rights post-Newtown. Echoing a sentiment that Sebastian made, Joes says we need to make this battle the last stand of the gun prohibitionists. Take no prisoners in this battle against the enemies of freedom. Neither accept nor offer a compromise that gives up anything. It is their time to compromise. It is their time to minimize the damage. It is their time to face political extinction. To put this in historical terms, this could be the Battle of the Bulge all over again. That started as a fierce attack with 30 Wehrmacht and SS divisions hitting a weak spot in the Allied lines. The first few days saw great US losses and the Allied position was very tenuous. However, as time passed, the Germans overextended themselves and began to be pushed back. In a little more than a month from the start, the German Army units were crushed and pushed back into Germany. The surrender of the Third Reich came less than six months after the attack began. If we do our part, this will be the gun prohibitionists' Battle of the Bulge. As SayUncle said, "Hey, I know that guy." Gene Hoffman was interviewed by CBS correspondent Ben Tracy yesterday on the CBS Evening News with Scott Pelley. He gave a great interview and explained the popularity of the AR-15. Interestingly enough, they never mentioned that Gene is the chairman of the CalGuns Foundation which is probably just as well. They only identified him as an "Internet entrepreneur". "Look, the right to firearms, the civil right to firearms, is dangerous and that's why it's a right. This isn't something that's free or easy. There will always be people who disagree with it." he added. "The AR-15 is the kind of mainline rifle these days. It's the most popular selling firearm. It's kind of like talking about a Chevrolet," Hoffman said. Gene is a great spokesman on this issue. He is a good public speaker and comes across really well on TV. He looks like the guy next door which is exactly the image that we need to get out there. "Shut Up And Think Before They Act Recklessly Again"
Commentator Michelle Malkin was a guest on Sean Hannity's show yesterday. The topic of discussion was the call for more gun control in the wake of the school shooting in Newtown, CT. Both she and Sean brought out the hypocrisy of the Obama Administration in their calls for new gun control legislation at the same time as it was discovered that a firearm purchased by ASAC George Gillet of the BATFE's Phoenix Field Division was found at the scene of a murder in Mexico. Malkin was particularly effective when she, in her words, took off her hat as a political pundit and spoke as a mother. She called upon politicians to "for once, stop, shut up, and think before they act recklessly again". Reality Check with Ben Swann is a feature of Fox19 out of Cincinnati, Ohio. From what I can see, he makes a lot more sense than most in the mainstream media. Swann is the co-anchor of the evening news on Fox19 and has won two Emmys. North Carolina and the nation lost a good gun rights attorney on Tuesday. Colonel James Henry Jeffries III died in Greensboro after a battle with stomach cancer. I knew Jim from a list here in North Carolina that dealt with gun rights. He continued to be active on it almost to the end as he posted about a NC Court of Appeals decision concerning a felon in possession less than two weeks before he passed away. His family requests that any memorials in lieu of flowers be made in his name to the Marine Corps Wounded Warrior Regiment which can be contacted at wwrdonations@usmc.mil. Dave Hardy said of Jim, "back when he was practicing he was probably our greatest expert on NFA law." ATF’s official response was that they knew nothing about this, and that it must have been individuals acting on their own, without agency approval. This strikes me as a little far-fetched, that two agents would go out at 7:00 AM on their own time on an unapproved fishing expedition, but maybe that’s what happened. No one has bothered me or my ex-wife since Jim Jeffries wrote the above letter. I have posted the letter in question below in its entirety. From what others have told me, this isn't the only letter of this sort that he wrote to the BATF telling them where to stick it. I represent Mr. John Ross of St. Louis, Missouri. Mr. Ross is an investment broker and financial adviser with a respected investment firm in St. Louis. He has degrees in English and Economics from Amherst College. Mr. Ross is very active in community and public affairs. He is the grandson of President Harry Truman's press secretary, Charles Ross, and was himself the Democratic Party candidate for the United States House of Representatives from the Second District of Missouri in 1998. In short, Mr. Ross is an upstanding and productive member of his community. Mr. Ross has had a lifelong interest in firearms and is both a Federal Firearms Licensee and a Special Occupational Taxpayer under the National Firearms Act. Of central importance to the purpose of this letter is the fact that Mr. Ross is also the author of Unintended Consequences, a highly popular novel about the trials and tribulations of legal gun owners and dealers in the United States. Although the book is manifestly a work of fiction, it accurately depicts documented historical events in the long and sordid history of misconduct by personnel of the Bureau of Alcohol, Tobacco and Firearms. The book is in its fifth hardcover printing with some 50,000 copies in circulation and has become enormously popular among the gun owners of the United States. Because the book is highly critical of the Bureau of Alcohol, Tobacco and Firearms, it appears that some in your agency have undertaken to suppress it and to intimidate its author. For example, in 1997 the book's publisher became aware that individuals purporting to be BATF agents had threatened vendors of the book in at least three different states with "problems" if they did not cease their sales of the book. A full-page ad in Shotgun News offering a $10,000 reward for the identity of these individuals put a stop to that particular business. I note in passing that best-selling author Tom Clancy in recent books has murdered a Director of the FBI, the President of the United States, the entire Congress, the Supreme Court, the entire cabinet, the Joint Chiefs of Staff and a few lesser functionaries. I presume he has not thereby become subject to investigation by your literary critics. 1. As an experienced federal prosecutor I am fully aware of what is going on here. Disgruntled former spouses are a prime source of intelligence for law enforcement, having as they frequently do both a strong bias against the subject of the investigation and the proximity and intimacy to know many things not available to others. A structured approach such as this required, according to your manuals, formal agency approval. It required the investment of time and effort in setting up the approach: determining Mrs. Ross's new address, learning her new telephone number, physical surveillance to determine her routine so that she could be approached in a way that she could not simply shut the door and where there would be less risk of confirming witnesses, the use of a female agent to lessen any apprehension at being approached publicly by strangers, etc. What kind of people are you? Is there no honor within the ranks of your agency? It has long been clear, from repeated court decisions and congressional committee reports, that your agents have no familiarity with the Second, Fourth, Fifth and Sixth Amendments to the United States Constitution. Now it appears that they have not even been introduced to the very first Article of the Bill of Rights. I am writing to express our outrage about this conduct and to formally demand that your agency cease and desist from this unconstitutional abuse of power. I am contemporaneously making formal Freedom of Information Act and Privacy Act demands upon BATF for the records and files pertaining to Mr. Ross, his book, and these events. By copies of this letter I am requesting the Inspector General of the Treasury Department to formally investigate this unlawful conduct and the Attorney General to investigate to determine whether Mr. Ross's civil rights are being violated by the Bureau of Alcohol, Tobacco and Firearms. We in the gun rights community were fortunate to have an attorney of Col. Jeffries' caliber on our side. Rest in peace, Col. Jeffries. How the times change. Does this mean that the ECB now accepts 44 caliber hollow points as Tier 1 collateral? It goes to show big business and especially those in the financial services field are not our friends. They sway with the political winds and run away from anything that their PR experts tell them is controversial. ECB, by the way, is the European Central Bank. Pastor Kenn Blanchard posted this video message yesterday. He is correct: you can't fix broken people with a law. And the shooter in Newtown, CT was a broken person. You should watch this entire message. Share it with your friends, family, and co-workers. Michelle Malkin had an interesting commentary today regarding the witch hunt that this being conducted by the gun prohibitionists and their friends in politics, academia, and the media. Blood-lusting hate speech must not get a pass just because it comes out of the mouths of the protected anti-gun class. Recognizing the time to act is now if we are going to stop any new gun control bills, Paul Valone of Grass Roots North Carolina sent out this alert last night. It says we need to meet the threat head-on. It proposes a three-prong approach consisting of contacting NC's Congressional delegation, conducting public education, and reframing the debate. Earlier alerts this week have discussed the ineffectiveness of the Gun-Free School Zone Act. The alert also gives contact information including phone numbers for the newly elected members of the North Carolina delegation. Given that they took a strongly pro-gun rights stance, it is important to remind them of that. As we predicted, the battle is on. 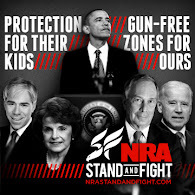 Dancing in the blood of innocents slaughtered by the federal “Gun Free” School Zones Act, Senator Diane Feinstein finally admitted to “Meet the Press” thatshe will offer a ban on semi-automatic firearms on “the first day” of the new Congress. “Who needs these military-style assault weapons? Who needs an ammunition feeding device capable of holding 100 rounds?” Feinstein wrote on her campaign website. Reframe the debate: For ten of the worst years of school shootings, the last so-called “assault weapon” ban failed to make a dent in the problem. What has actually exacerbated such shootings is the 1996 federal “Gun Free School Zones Act,” which announces clearly to predators that victims in schools are disarmed. After five days of silence, the NRA has finally spoken, via an oblique statement in which it says it will “help to make sure this never happens again”. What does that mean? The NRA has previously caved on things like the“Disclose Act,” which would have muzzled gun rights organizations, or the “NICS Improvement Act,” which institutionalized reporting private medical information to the FBI. Whatever the NRA does, GRNC will be at the forefront of defending your rights! GRNC will need your help! We can stop the freight train rolling toward restrictions on your individual freedoms, but doing so means pulling together. Please keep on eye on future GRNC alerts as we keep you informed on how best to defend your rights. As was mentioned yesterday in relation to the announcement that Cerberus Capital Management is putting the Freedom Group up for sale, the threat of the California State Teachers Retirement System to remove $500 million in investments from Cerberus was a good part of their rationale. It appears that CalSTRS was itself reacting to the bad press it was getting regarding their investment in Cerberus and, by extension, the Freedom Group. Do you know who owns more than a 6% stake in the maker of .223 Bushmaster rifles, like the one used last Friday to murder 20 first graders and seven adults in Newtown, Connecticut? California public schoolteachers. The company in question is Freedom Group, a privately-held firearms conglomerate formed by private equity and hedge fund group Cerberus Capital Management. Cerberus created the platform in April 2006 via the acquisition of Bushmaster, after which it added another 10 makers of firearms, ammunition and accessories (including Remington, Marlin Arms and Barnes Bullets). The California State Teachers' Retirement System (CalSTRS) committed to invest a whopping $500 million into a $7.5 billion Cerberus fund that has helped bankroll Freedom Group. That means that it effectively could own a 6.67% stake in the gun maker, which filed to go public in late 2009 before pulling the offering in early 2011. In fact, the figure could be even higher since CalSTRS also committed $100 million to a $1.4 billion predecessor fund, which likely made the original investment. But I also think that it's time for our large nonprofit institutions to put some of their money where their mission is. Profit should be the primary goal of their investment offices, but not at the expense of their broader purposes. If a schoolteachers union or university endowment or nonprofit foundation truly cares about stopping the next mass killing, then they should not provide capital that produces the instruments of such destruction. By Primack's rationale, CalSTRS then should not invest in any company that makes or deals in petroleum products, agricultural fertilizers, metal hardware, garden tools, or any number of other products that could have been used to make improvised explosives or sharp pointy things. Obviously, this sort of nonsensical criticism found its mark with the CalSTRS's investment board. They released this statement regarding their investment with Cerberus and the pending sale of the Freedom Group. "The tragic and devastating acts that took place December 14 at Sandy Hook Elementary School in Connecticut have prompted many in this country to call for change: To determine what we can do differently to help ensure the unthinkable never happens again. "In our case, CalSTRS investment staff immediately began reviewing our investments in private equity funds managed by Cerberus Capital Management (Institutional Series Three and Series Four) that are invested in the Freedom Group, which manufactures firearms. Our investments staff also initiated discussions with Cerberus to learn more about the facts surrounding the investments. "This morning, Cerberus Capital Management issued a statement (External link) noting its intent to immediately engage in a formal process to sell its investment holdings in the Freedom Group. "Cerberus is a multi-strategy private equity firm. They invest in a wide variety of firms and strategies; Financial Services, Healthcare, Consumer & Retail, Manufacturing & Distribution, Building Products, Energy & Natural Resources, Apparel, Paper, Packaging & Printing, Transportation, Industrial & Automotive, and Travel & Leisure. "CalSTRS first invested in Cerberus Capital Series 3 in 2003, and again in 2007 in Cerberus Capital Series 4 as part of the core Private Equity program. The Freedom Group represents a very small investment within these funds. CalSTRS owns 2.4 percent of Freedom Group, not 6.67 percent as reported by some media outlets. "CalSTRS has established a thorough vetting process for potential investments that seeks to test not only their financial potential, but their social, human and environmental impacts as well. In fact, current policies require that the risks associated with products that pose significant threats to human well-being be taken into account before an investment is made by CalSTRS investment managers. They are outlined in CalSTRS 21 Risk Factors (PDF - 5.5MB), which we adopted in 2008 after our investments in Cerberus. "Moving forward, CalSTRS will work to ensure that all of our investments are taking these very important criteria into consideration." The California State Teachers' Retirement System, with a portfolio valued at $154.8 billion as of October 31, 2012, is the largest educator-only pension fund in the world. CalSTRS administers a hybrid retirement system, consisting of traditional defined benefit, cash balance and voluntary defined contribution plans, as well as disability and survivor benefits. CalSTRS serves California's 856,000 public school educators and their families from the state's 1,600 school districts, county offices of education and community college districts.